Teachers from public schools in Hampshire and Franklin counties chosen for this year’s Pioneer Valley Excellence in Teaching Awards will be honored April 26 at the Log Cabin in Holyoke. The 15th annual awards, sponsored by the Harold Grinspoon Charitable Foundation, come with $500, local YMCA memberships, one-year membership to WGBY and college tuition at a participating college or university, among other items. Amherst-Pelham schools — Richard Eckart, Amherst Regional High School; Kelly Carlisle, Pelham Elementary; Tiffany Thibodeau, Amherst Regional Middle School; and Carissa Ackroyd, Fort River Elementary. Belchertown — Christina Brach, Chestnut Hill Community School. Easthampton — Kelly Przekopowski, Center School; Alexander Alvarez, Easthampton High School; and Jasmine Gomez, Pepin School. Frontier Regional — Chevy Seney, Frontier Regional School; and June Chamberlain, Conway Grammar School. Gateway Regional — Denae Dostal, Littleville Elementary School. Gill Montague Regional School District: Sharyn Wood, Sheffield Elementary. Greenfield Public Schools: Marguerite Rancourt, Discovery School at Four Corners; Angela Mass, Greenfield High School; and Gina Clark, Federal Street School. Granby — Lesley Mahoney, Granby Junior/Senior High School. Hampshire Regional — Jeffery Carreiro, Hampshire Regional High School; Erin Zimbler, Westhampton Elementary School; and Laura Geryk, New Hingham/Chesterfield-Goshen Regional School. Mohawk Trail Regional School District: Taffy Ruggeri, Mohawk Trail Regional School. Northampton — Kim Gerould, Jackson Street Elementary; Hannah Kristek, Leeds Elementary; Melanie Samolewicz, Northampton High School; and Kaitlin Schofield, JFK Middle School. South Hadley — Jeanne Chenier, Plains Elementary School; and Ezra Bleau, South Hadley High School. The Pioneer Valley Excellence in Teaching Awards is a program sponsored by the Harold Grinspoon Charitable Foundation in Agawam to honor teachers in Franklin, Hampshire and Hampden counties for teaching practices, demonstrated enthusiasm, volunteer work and community outreach. Since mid-February, 113 teachers have been surprised in their classrooms by school administrators visiting with flowers and balloons to make the announcement of their selection as winners. They are being acknowledged after a rigorous selection process to identify “the best of the best” in each of the participating districts. Among the honorees, 18 are receiving the New Teacher Award, designated for promising educators with 1-3 years’ full-time experience. 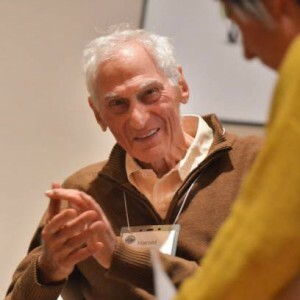 Harold Grinspoon, of Longmeadow, is a philanthropist who made his living as a real estate entrepreneur after dyslexia prevented him from going to college. He started the Harold Grinspoon Foundation with his wife, Diane Troderman, in 1993. The Pioneer Valley Excellence in Teaching Awards program began in the 2002-2003 school year. Now in its 15th year, the program has honored more than 1,300 educators in western Massachusetts. In addition to the Grinspoon foundation, the program is sponsored by MassMutual and the Irene E. and George A. Davis Foundation. For a complete list of this year’s Excellence in Teaching award recipients, click here.